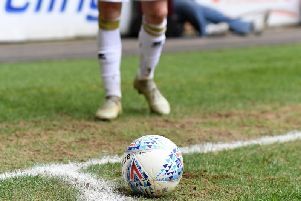 A good run of form is an easy way to get carried away in football, but MK Dons' FA Cup defeat to Grimsby Town will help bring them back down to earth with a bang. Nine games undefeated in League 2 has seen MK Dons climb to second in the table, on their best run since a promotion winning drive in 2015. The one bump in the road during that run was a 3-0 defeat to Luton Town in the Checkatrade Trophy, but at Kenilworth Road, Paul Tisdale named a significantly depleted squad. Saturday's FA Cup defeat came with the same team who ran riot against Crawley a week earlier. It was a reality check Dons needed. In realistic terms, while they had lost three games in all competitions this season before kick off at Grimsby, only the loss at Lincoln City really mattered. Few predicted anything less against Premier League Bournemouth in the Carabao Cup, while Dons' second string were beaten by League 1 Luton on a hot-streak of their own. Heading to Blundell Park, Dons were enjoying the best of times. Their biggest win of the season came against Crawley, Tisdale had just won Manager of the Month, and their next league outing is against the team bottom of the table and a win would send them top as Lincoln are not playing. Morale and confidence could not be higher. The FA Cup was something of a free pass in a sense, a game which would not really impact Dons' long term ambitions this season, but against League 2 opposition, and struggling League 2 opposition at that, Dons' 3-1 defeat will provide the lead shoes Tisdale needs to keep his players firmly grounded. The manager though does not believe his players are growing complacent. "Had we been really poor in the first half, I'd have said yes but I saw no signs of that," he said. "It was a second half response which we didn't expect. They scored an equalised and I expected us to step up. I was disappointed to see that unravel into two or three goals. "There was a proper focus and discipline about how we played, but there are some young players in there who need to understand the opposition are entitled to do things of their own, and we have to respond. We lost our flow. "We put the same team out that won at Crawley last week so there's no part of our preparation that was differing from 'same again.' I've had very few reasons to be disappointed by my team so far, but today was a bit of a disappointment. It needs to be part of our psyche, we shouldn't forget it and it will make us a better team hopefully." "We will look at all the dimensions, emotions and dynamics. We've done pretty well so far, but I'm not taking anything for granted. It's the FA Cup, but it's a game of football against a team in our league and we've been pretty good against teams in League 2 this year. I wanted better." But just as one win will not make or break a season, neither will one defeat. Dons' response to the defeat at Grimsby however will be far more telling than the result.